Advertising expenditure in India is expected to reach ₹91,742 crore by 2021, from ₹62,699.3 crore in 2018. New Delhi: India is set for an advertising boom with a predicted 46% surge in advertisement spending during 2018-2021, said Publicis Groupe’s media agency Zenith. The robust performance will help India break into the world’s top 10 advertising markets for the first time and become the eight largest market by 2021, Zenith said in its advertising expenditure forecasts report issued on Monday. 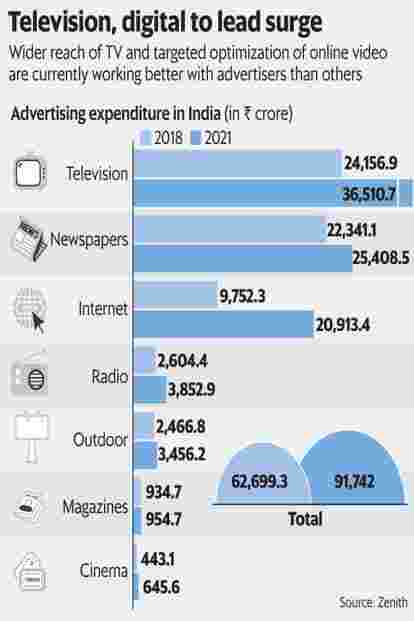 Advertising expenditure in India is expected to reach ₹ 91,742 crore by 2021, from ₹ 62,699.3 crore in 2018, the agency said. The growth will reflect on all forms of media, according to the report. While newspaper advertising is forecast to rise to ₹ 25,408.5 crore from ₹ 22,341.1 crore, magazine advertising will grow to ₹ 954.7 crore from ₹ 934.7 crore in the same period. Television advertising will climb to ₹ 36,510.7 crore from ₹ 24,156.9 crore. Digital advertising will see a big jump, too, to ₹ 20,913.4 crore from ₹ 9,752.3 crore. Given that a bulk of the population is below 30 years, Zenith expects the rise in ad spending to be led by consumption growth. This year has also seen the depreciation of the rupee and oil price volatility but the overall expectation is that oil prices will stabilize, giving consumers more disposable income. Many parts of India are experiencing a digital evolution, led by the mobile phone, said Tanmay Mohanty, group chief executive at Zenith. This is likely to accelerate growth in categories such as banking, financial services, healthcare, entertainment and sports, travel and lifestyle, he said. “2019 is the year of India’s general elections. These and the state elections will boost marketing spends. Additionally, the Cricket World Cup and the Indian Premier League will drive growth," said Mohanty. Digital media will continue to grow both in reach and consumption. Television—linear and catch-up—will be on an upward curve. Radio is expected to digitize aggressively in response to streaming services, while both cinema and out-of-home media will innovate and increase reach-led investments. “Print will thrive on regionalization," Mohanty added. Global ad spend will grow 4.5% in 2018, reaching $ 581 billion by end-December. This will be boosted by the Winter Olympics, FIFA World Cup and US mid-term elections. Growth will remain steady for the rest of the forecast period to 2021, at 4.0% in 2019, 4.2% in 2020 and 4.1% in 2021. In the last decade, internet advertising has jumped from 12% of the total global spend (in 2008) to 41% (in 2018). Meanwhile the share of newspapers has fallen from 25% to 8%, while that of magazines declined from 12% to 5%. Television’s share peaked at 39.1% in 2012, fell to 34% in 2017, and is expected to be 29.9% in 2021. “Brands are transforming their businesses to take advantages of the new digital opportunities available to them," said Vittorio Bonori, Zenith’s global brand president. “Better segmentation and targeting, personalised creative and direct transactional relationship with consumers are combining to drive brand growth."